A battery grip will effectively double your shooting time and make a small camera body easier and comfortable to hold. If you are holding your camera and your last finger is not resting properly on the camera, that means your camera is too small for your palm. Not having a firm grip on your camera will result to camera shake, producing blurry images and also prolonged usage of your camera under this condition will stress and strain all your fingers, not just the last finger. 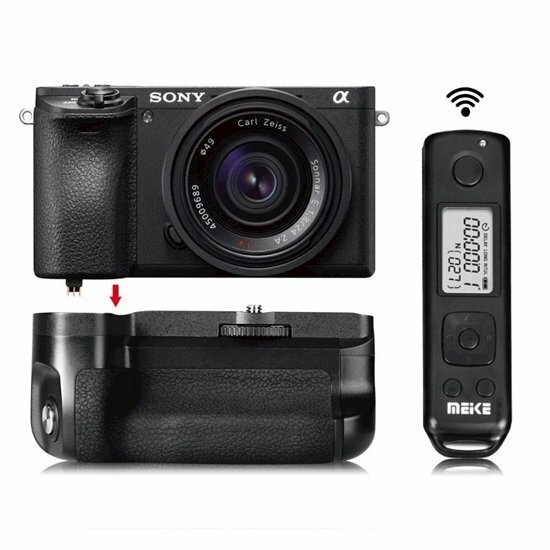 This Meike MK-A6500 battery grip comes with a shutter release button to make vertical shooting a breeze because you no longer need to twist your wrist to press the shutter release button on your camera. The Meike Wireless Remote Controller is powered by 2 AAA Batteries (Batteries are not included). Note: Camera Shown is not included.